An invincible part of the Potato Chips Making Machinery, the De-Hydrate Machine aids in drying the potato wafers and increases the production speed. Made up of S.S. body and fitted with 1HP motor, this machine, furthermore, gratifies with completely drying up the water content saving the fuel incur costs along with expenses on labor , finally saving time. Made up of S.S. body and fitted with 1HP motor,this machine, furthermore, gratifies with completely drying up the water content saving the fuel incur costs along with expenses on labor , finally saving time. 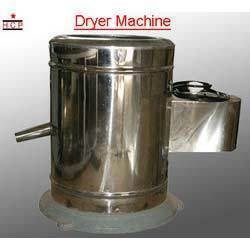 Backed by our in-depth industry expertise, we are manufacturing and supplying a superior range of Food Processing Machines such as Roti Making Machine, Papad Making Machine, Potato Chips Making Machine, Khakra Making Machine, Dairy Equipment, Kitchen Equipment, Potato Chips Plant, Namkeen Machine and Nylon Sev Machine. We also provide Papad Cutting Machine, Ribbon Blender Machine, Roasting Machine, Shrikhand Machine, Weafer Slicer Machine and Ind Flour Mill to our clients as per their requirement. Our range is manufactured using best grade raw materials and advanced technology. We are managed by a team of highly experienced professionals who are well versed in the industry and helps us to offer unmatched range of products to our clients. With their support, we also offer our range in various specifications that meet the individual requirement of our clients in efficient manner. Furthermore, we have developed a wide supply chain network across the globe to meet the urgent requirement of our clients within the stipulated time frame.